The story of the life of Emperor Tewodros II of the Abyssinian Kingdom is one of tragedy and heroism. Some claim he was the African reincarnation of Ivan the Terrible, while others view him as a man ultimately dedicated to his country, one who brought about the modern Ethiopia. 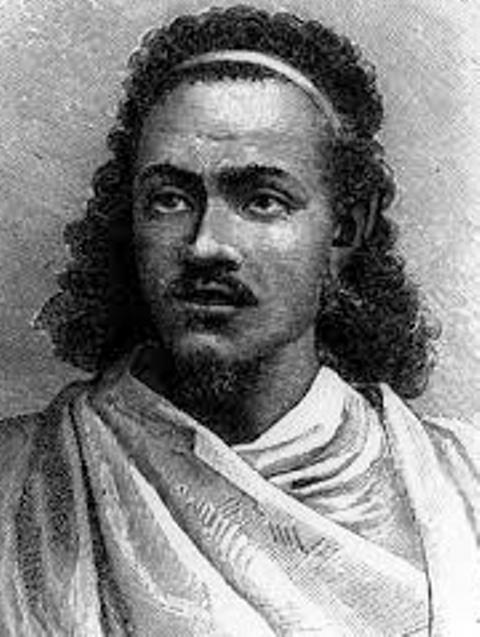 Emperor Tewodros was born Kassa Hailegiorgis or Kassa Hailu in 1818, and was the son of Hailegiorgis Woldegiorgis, a Christian noble and chief of the Qwara region in the province of Dembiya. Unfortunately for Kassa, his parents divorced while he was still a minor and Woizero Atitegeb, his mother, moved the both of them back to Gondar, as soon as they received word of his father's death. It is claimed by some that Kassa's inheritance was denied to him by his remaining family members and his mother had to become a "kosso shach" or seller of a worm killing medicine. Others believe there is no evidence to back this theory and say it was devised by his enemies to slander his name. As a young boy, Kassa was educated at the Tekle Haymanot convent in the Gondar region. He later left this convent and continued his formal education, learning the Bible, Ethiopian literature, ancient and modern European history, as well as, some Shakespeare. Considered a well educated man of his time and enjoying the protection of his half-brother, also often referred to as his uncle; Dejazmach Kenfu. 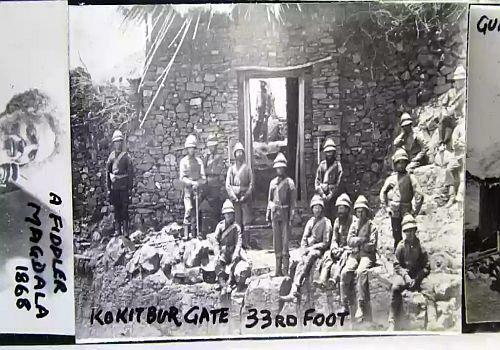 Kassa also served in Kenfu's army and received military training from him. By 1839, Dejazmach Kenfu passed away and along with his death Qwara was taken over by Empress Menen of Gondar. Kassa Hailu fled and became a "shifta" or outlaw that refuses to pledge their loyalty to the lord of the area. He was lauded for his capabilities on the battlefield as well as his magnanimous treatment of the locals, earning him the respect and love of the people. In time, he amassed a sizable army and began to take back what he believed was his birth right and more. He began with his father's province of Qwara which was given to him because of his growing power in the area. Kassa followed this by seizing the whole of Dembiya, and now, too powerful to ignore, Empress Menen, wife of Yohannes III offered him her granddaughter's hand in marriage, her name was Tewabech Ali. It is believed that their marriage was a successful one but was hampered by the blatant disrespect Kassa received from Empress Menen. The country at the time was going through a period of constant civil war and was known as the Age of Princes or Zemene Mesafint. Nobles and princes of various religious and ethnic backgrounds were all angling to take power over the Gondarine throne and therefore become emperor and king of kings. In 1852, he rebelled and within three years of fighting one army after another he captured Empress Menen. By 1855, he had received the submission of the weak Emperor Yohannes III and was crowned Emperor Tewodros II. Kassa's choice to use the name Tewodros was his attempt at fulfilling a prophecy that a man by this name would reign for forty years and restore the unity, as well as, greatness of the Empire. Emperor Tewodros in the successive years brought the powerful areas known as the Kingdom of Shewa and the Province of Gojjam under his control. Through a multitude of military campaigns he was further able to crush all opposition posed by the numerous lords and princes in Begember, Simien, Tigray and Wollo. For his capital city, he first chose to move it from its original place of Gondar to Debre Tabor and finally choosing the mountain fortress of Magdala. In Magdala, Emperor Tewodros II also imprisoned all the various princes and nobles that were constantly battling and vying for power. Among them would be the young Prince of Shewa, Sahle Mariam or the future Emperor Menelik II, whom he adored and gave his own daughter Alitash for marriage. With the emergence of this powerful new Emperor, Ethiopia had finally seen an end to almost 200 years of internal strife and civil war, the Age of the Princes was over. Menelik would soon escape the fortress leaving his wife and deeply hurting Tewodros' feelings. Furthermore, the death of Empress Tewabech left Tewodros without his confidant, friend, lover and advisor. Her influence on him was believed to have helped curb his more vengeful tendencies. With her passing, Tewodros was unleashed and this came in the form of extremely bloody acts of vengeance, as the beheading of 7,000 prisoners of a battle depicts. Emperor Tewodros remarried the daughter of one of his prisoners, Dejazmatch Wube. The new Empress, Tiruwork Wube believed she had married below her and was further angered by his refusal to release her relations from prison. Claiming her ancestry was in the direct line of the Solomonic dynasty, she viewed Tewodros as a usurper, and they never had a good relationship. Probably the single greatest thing she did for her husband was birthing his beloved son and heir, Prince Alemayehu. By 1862, aside from the immediate area surrounding his mountain fortress capital of Magdala, the entire country was attempting to revolt in one way or another. To add to this, Abyssinia was being threatened by Muslim Turks, Egyptians, and Sudanese. From within the country, the Oromo Muslims of central Abyssinia were continually posing a menace to the country's leadership. With Emperor Tewodros' internal and external enemies proving to be too numerous he was left with no choice but to make his first venture into foreign relations by writing a letter of 'friendship' to Queen Victoria. The letter was an appeal to a Christian nation, for assistance in battling for the survival of his country. Unfortunately, the letter received no reply, and after two years of waiting, he imprisoned all British and some European subjects, in a move to get the Queen's attention. By the third year, the English sent Hormuzd Rassam, who had a letter from the Foreign Office in which it stated "It is not desirable for Her Majesty's Agents to meddle in the affairs of Abyssinia." Emperor Tewodros already vengeful and erratic immediately imprisoned the envoy. Every endeavor to have the prisoners' released failed and new envoys were dispatched and they, also, were imprisoned. In time the British government lost patience and in 1867 issued an ultimatum: release the prisoners within three months or face the consequences. Emperor Tewodros II refused to acquiesce to their demands, leaving many historians pondering the reasons for his rejection. Some claim that he was planning to use the pending foreign invasion as a unifier to bring together the entire nation under one banner. Furthermore, he would use the prisoners as a way to get the assistance of the British against the Egyptians and Turks, then in a show of grace, release the prisoners. But if this indeed was the true plan, it failed and the British-Abyssinian war would commence leading to the tragic, yet heroic suicide of Emperor Tewodros II. The widowed Empress Tiruwork and Tewodros' beloved son and heir Prince Alemayehu, were captured and to be taken to England. Unfortunately, tragedy befell as Empress Tiruwork died on the journey to the coast, and young Prince Alemayehu made the journey alone. Emperor Tewodros II is seen as one of Ethiopia's most notable emperors and the first modern leader who unified the various kingdoms into one empire. Tewodros had a vision of a powerful, centralized monarchy and pursued that vision single-mindedly throughout his reign. He started by attempting to replace the old, stale feudal hierarchy with a sleeker, more meritocratic bureaucracy. He also tried to modernize the military, showing a special interest in new technology. 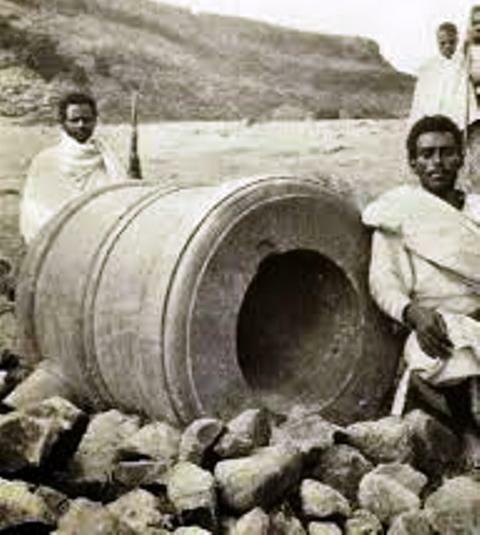 He ordered European missionaries living in Ethiopia to build him a cannon and, later in his career, hired weapons makers from England to come to his court and build him new armaments. 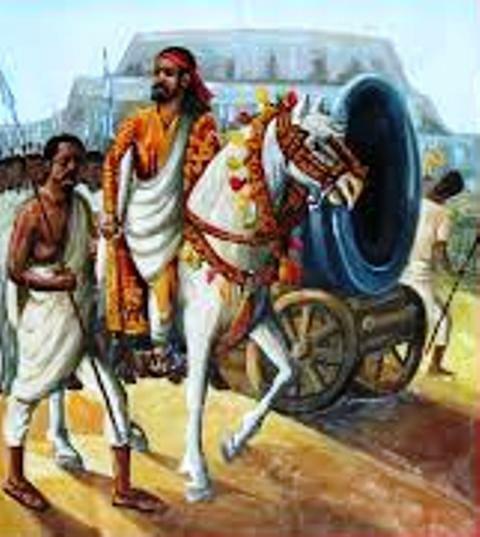 Tewodros also created Ethiopia's first professional standing army, doing away with the old method of raising a new army from the provinces every time a new campaign or war started. Today Ethiopians view the Emperor as a hero, with the dramatic and bold nature of Tewodros's death being the main reason for his status as a national icon. Yet, unlike Emperor Menelik II and other heroic leaders, there are some reservations as his often violent actions taken during his reign make him too controversial.